Bahurani ("Daughter-in-law queen", a respectful address) is a sweet little film about the triumph of innocence and honesty over cruelty and greed. It's an unsubtle morality tale - the sort of story in which the bad guys get forgiven rather than punished - but it is immensely enjoyable, due in no small part to Guru Dutt's sensitive acting and Mala Sinha's tough, rash, but straightforward village girl turned zamindar's daughter-in-law. A wealthy landowner - in Hindi, zamindar (Nazir Hussain) - has two sons - Raghu, by his first wife (who is dead), and Vikram, by his second wife. Raghu (Guru Dutt) is "pagal," crazy, which in Hindi films often seems to mean the same thing: he's an arrested development case, a grown man with the mind of a four-year-old child. Vikram (Feroz Khan) is arrogant, selfish, and greedy - he always carries a whip or a riding crop and beats anyone who doesn't immediately succumb to his whim, including servants, villagers, and even Raghu. Vikram's mother dotes on her son and reviles her guileless stepson Raghu. After Vikram has a run-in with the tough village girl Padma (Mala Sinha) who is the first person to actually stand up to him, the zamindar has the brilliant idea of marrying Vikram and Padma. Vikram's mother flatly refuses, however - her son is too good for a penniless villager - and Padma ends up married to Raghu instead. When she sees the tyranny with which Raghu has been treated, she vows to set things right, falling in love with the gentle Raghu in the process. Bahurani's portrayal of mental illness (and of curing it) is too simplistic and its villains - Vikram and his mother - are both too cartoonish and too cheaply redeemed. But as allegory the film works well, and it's both touching and engaging. Padma encapsulates the traits of a variety of Hindu goddesses - the courage to stand up against injustice, a love of and dedication to education, nurturing mother-love, limitless capacity to bear hardship and limitless capacity for forgiveness. (Thanks to crazyone at BollyWHAT? for enumerating some of these traits for me.) And Padma tirelessly nurtures Raghu's innocence, bringing him to enlightenment and healing without compromising his basic goodness and inherently gentle nature. Even the film's evildoers find redemption in the light of Padma's justice. The best thing about Bahurani may be Guru Dutt's performance. Raghu is not just a whiny, stunted head-case; his innocence shines in his eyes. 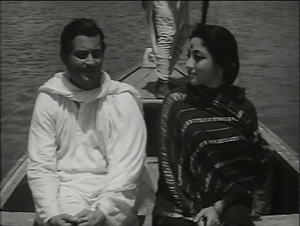 Mala Sinha also strongly conveys Padma's fiery combination of tenderness and indignation. Carefully constructed symbolism lends reinforcement to the film's themes. For example, Vikram's ever-present riding crop is a symbol of his internal doubt and secret impotence. In one scene he sits astride a horse who chafes and bucks, suggesting that even the animal is unhappy succumbing to his will. Finally, Bahurani offers some very lovely music, including a cute but bittersweet-sad childish song by Raghu, a suggestive qawwali picturized with a tasty mujra by Vikram's tawaif girlfriend, a lullaby picturized on Mala Sinha, and a number of others, a generous total for a film only a little more than two hours long.